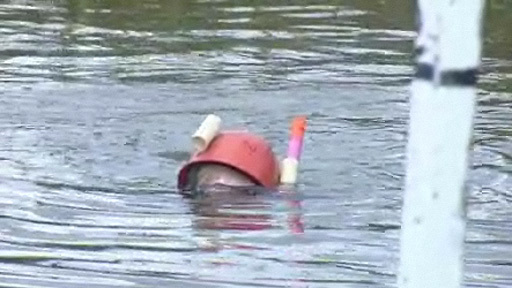 But for madcap sport fans the World Mountain Bike Bog Snorkelling Championships is a must-do event. As the Tour de France started in Brittany, in the Powys town of Llanwrtyd Wells, cyclists headed for the bottom of a 6ft deep peat bog wearing a mask and snorkel on Saturday. On Sunday, they take on the gruelling challenge of The Bog Triathlon. Both events are spin-offs of the popular - and now notorious - World Bog Snorkelling Championship, which takes place in the picturesque town every August Bank Holiday. Competitors first added a mountain bike to the bog-snorkelling proceedings in 2005 and it has been growing in popularity ever since. Those who accept the challenge use a bike prepared with a lead-filled frame and water-filled tyres to ensure grip on the pond bottom. The snorkeller-cyclist wears a lead weight belt to avoid floating off the bike. While what is known as scuba drivers are on hand for safety purposes. Organiser Sheila Tomkins, who is part of Green Events Ltd which has put together the whole menu of bog snorkelling events, said: "We have had a little rain but of course that doesn't bother the competitors today. "We have just had the first person through, a woman, who found it physically demanding but got through in 4 minutes 31 seconds. "Turn out is excellent and there is a real buzz going round. We have just had a group of 10 people turn up from Bragster.com. "That is a website for people who dare each other to turn up and take part in challenging events, which this obviously is. "All the signs are that this is quickly becoming an event which people will turn up to take part in and watch." For some, however, Saturday's event is simply a warm-up for Sunday's more gruelling challenge The Bog Triathlon. Organisers say the triathlon was set up to accommodate overwhelming demand for "more dirty fun around our famous Waen Rhydd Bog". "The event is one of the most unusual in the triathlon calendar and starts with a 12 mile run," a spokesman for the event said. "It is followed by two lengths of the 60 yard peat bog trench and then a 25 mile mountain cycle. The event is open to individuals and relay teams"